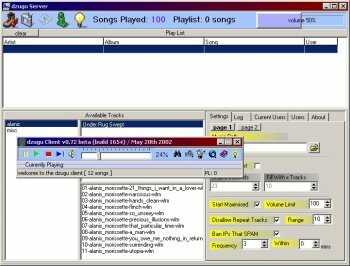 dzuguMoosic allows everybody on a LAN to control the music output from a PC which contains MP3s and has speakers. All clients have the ability to add songs to the server`s playlist, alter volume, change tracks etc. The server software can be setup to automatically play random tracks if the playlist lies empty for too long, ban people from issuing commands.